This is to inform you that the Board of Directors at the meeting held today i.e.,11.11.2016 has accorded its approval for the buy-back of 1,50,000 Equity Shares of face value Rs. 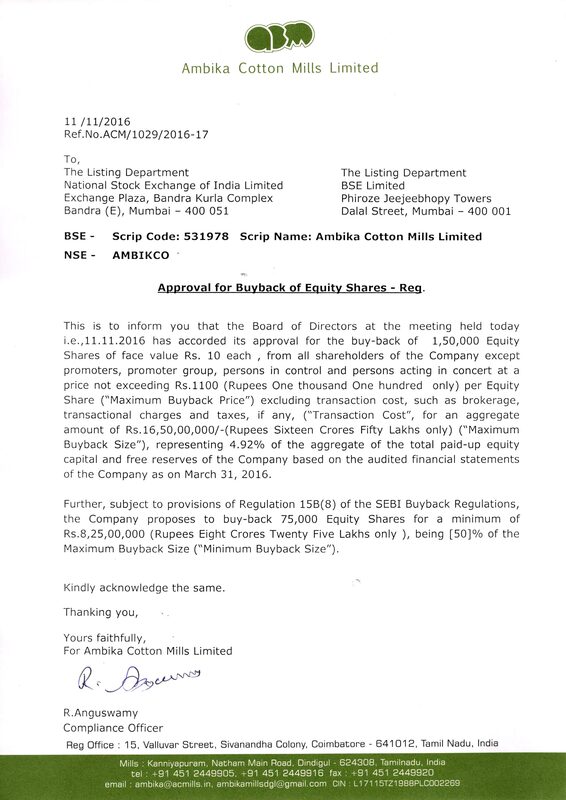 10 each , from all shareholders of the Company except promoters, promoter group, persons in control and persons acting in concert at a price not exceeding Rs.1100 (Rupees One thousand One hundred only) per Equity Share (“Maximum Buyback Price”) excluding transaction cost, such as brokerage, transactional charges and taxes, if any, (“Transaction Cost”, for an aggregate amount of Rs.16,50,00,000/-(Rupees Sixteen Crores Fifty Lakhs only) (“Maximum Buyback Size”), representing 4.92% of the aggregate of the total paid-up equity capital and free reserves of the Company based on the audited financial statements of the Company as on March 31, 2016. Further, subject to provisions of Regulation 15B(8) of the SEBI Buyback Regulations, the Company proposes to buy-back 75,000 Equity Shares for a minimum of Rs.8,25,00,000 (Rupees Eight Crores Twenty Five Lakhs only ), being % of the Maximum Buyback Size (“Minimum Buyback Size”).